Are you fed up of wrestling with your wet gear? There’s a product on the market that can help solve your wet gear woes – welcome The Dry Bag. 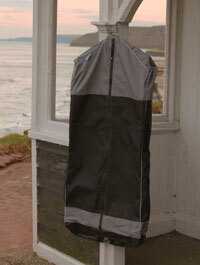 The Dry Bag is a full length zip up bag that protects your wetsuits and wet garments from direct sunlight whilst letting them drip dry efficiently yet naturally. Mesh vents enhance air flow and a water reservoir collects the residual water – no puddles here! A specially designed hanger can take up to 25kg in weight enabling you to hang all your wet gear in one bag keeping your living space tidy. Designed with the weekend warrior in mind, side vents on The Dry Bag Pro let natural air flow around your wet gear so it can dry hanging in your house or van. And if you usually dry your wet gear outside, the strong, showerproof fabric will protect your wetsuit from the damaging UV rays increasing the lifespan of your suit. Dripping water is caught in a reservoir built into the base of the bag so your van, house or outdoor space is kept tidy and dry. You simply unplug it to drain the water away. And if you’re looking for a sturdy hanger, the Dry Hanger holds 25kg in drop weight and has been designed to fit perfectly inside The Dry Bag. If you’re in the water regularly, The Dry Bag Elite dries your wet gear that little bit quicker than the Dry Bag Pro thanks to a full mesh front which lets air flow around your wet gear. Strong, UV protected, showerproof fabric means you can hang it outside too, safe in the knowledge your wetsuit is protected from damaging UV rays. The water reservoir at the base of the bag catches the water from your wetsuit and you simply unplug it to drain away – finally a way to dry your wet gear without the mess! The result – dry kit ready for your next adventure. And if you’re looking for a sturdy hanger, the Dry Hanger holds 25kg in drop weight and has been designed to fit perfectly inside The Dry Bag.